This past Thursday I took a few hours off work so I could attend the official presentation of First Nations artist Kent Monkman's installation, Nativity Scene, at Museum London. 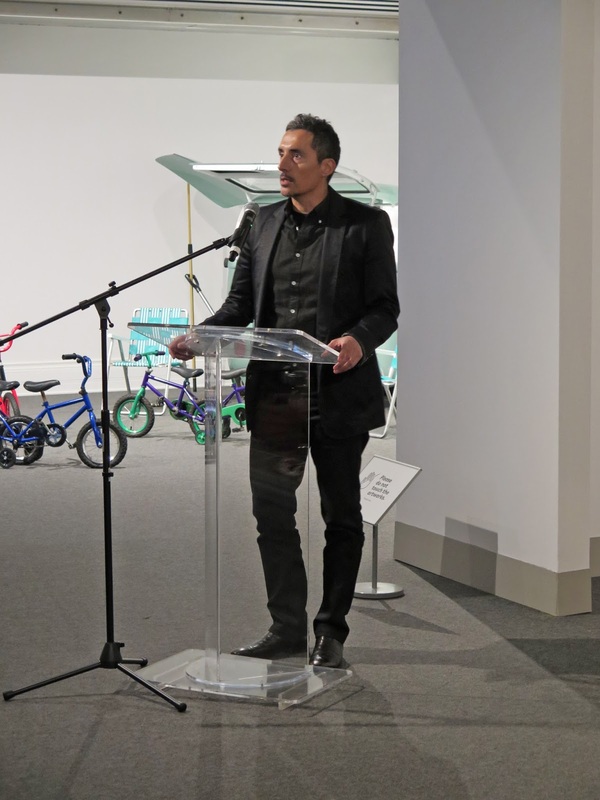 The piece was purchased for the Museum's permanent collection with funds raised by the Museum's Volunteer Committee Acquisition Fund, and was dedicated to the memory of long-time volunteer, Shelagh Martin-McLaren. 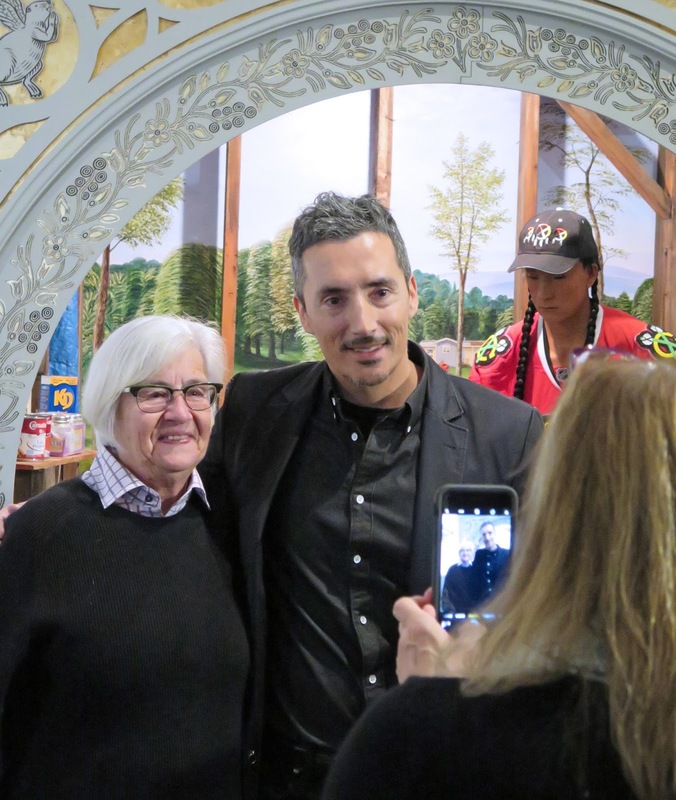 Members of Martin-McLaren's family were present at the event, as was the creator of the piece, Kent Monkman. I have been fascinated and moved by Monkman's work since I viewed his installation "The Rise and Fall of Civilization" at the Gardiner Museum in Toronto a couple of years ago, which I wrote about here. 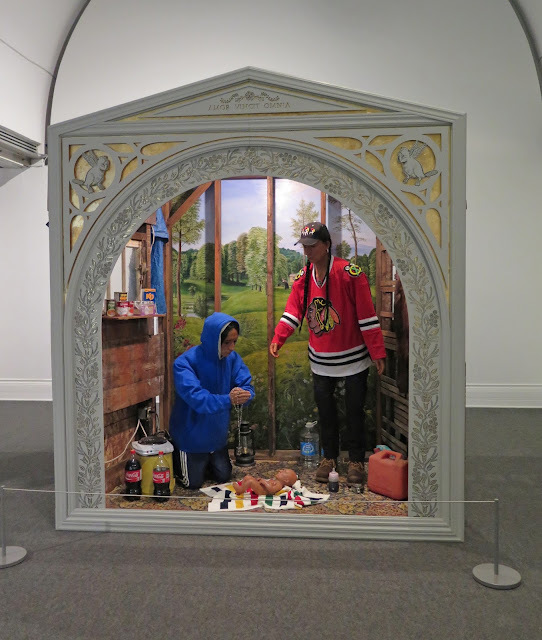 Nativity Scene, above, has been on tour as part of the Canada 150 celebrations, and is part of a larger exhibit of works by Monkman titled "Shame and Prejudice: A Story of Resilience". The phrase 'Amor Vincit Omnia' (Love conquers All) is carved into the peak of the front piece. Monkman, a Canadian artist of Cree and Irish ancestry, works in the mediums of painting, drawing, installation and performance to put forth an alternative, and more historically accurate, narrative of the treatment of Canadian First Nations people at the hands of European settlers. He incorporates just enough campy, sarcastic humour into his work to act as a counterbalance to his disturbing, symbol-filled narratives. 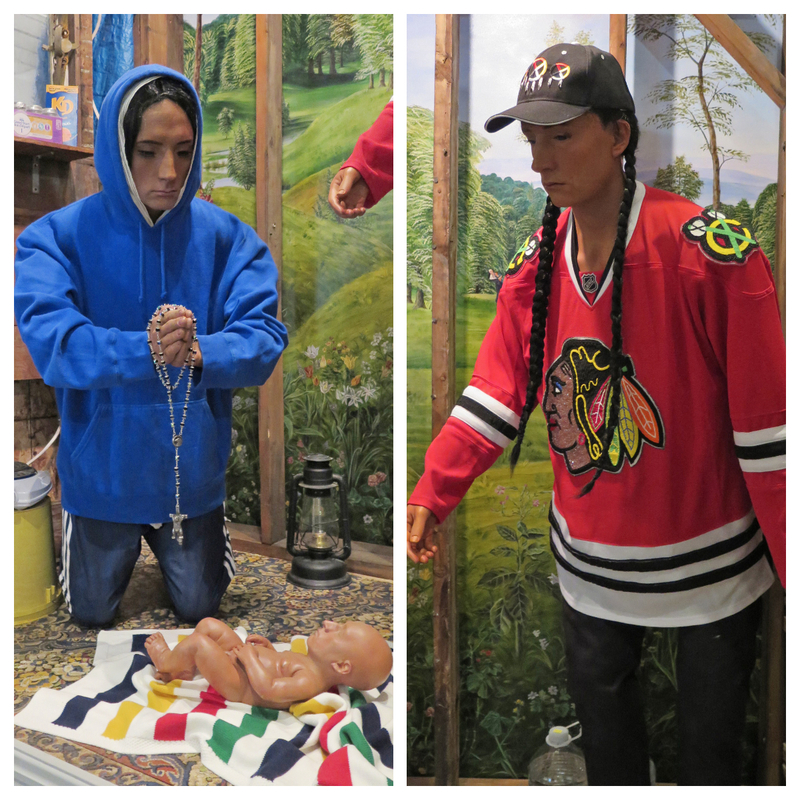 The Shame and Prejudice: A Story of Resilience exhibit is divided into a series of chapters narrated by Monkman's alter ego, Miss Chief Eagle Testickle, a play on the phrase "mischief egotistical". Nativity depicts Miss Chief's birth. 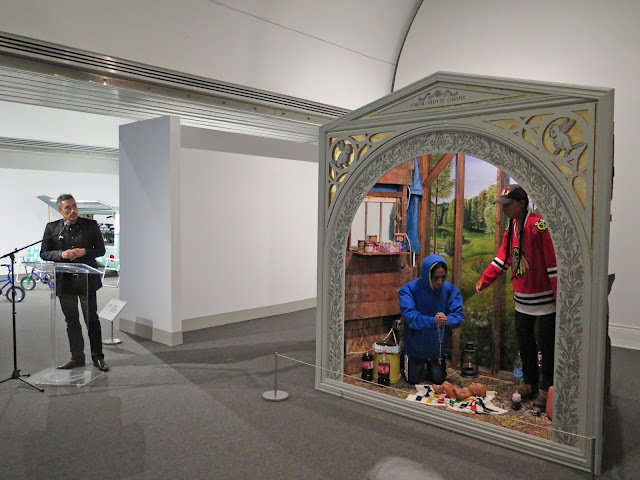 The three figures in the piece have Monkman's face, the artist's comment on the dioramas he has seen in many galleries and museums where the same model was used for the faces of all the Indigenous figures. 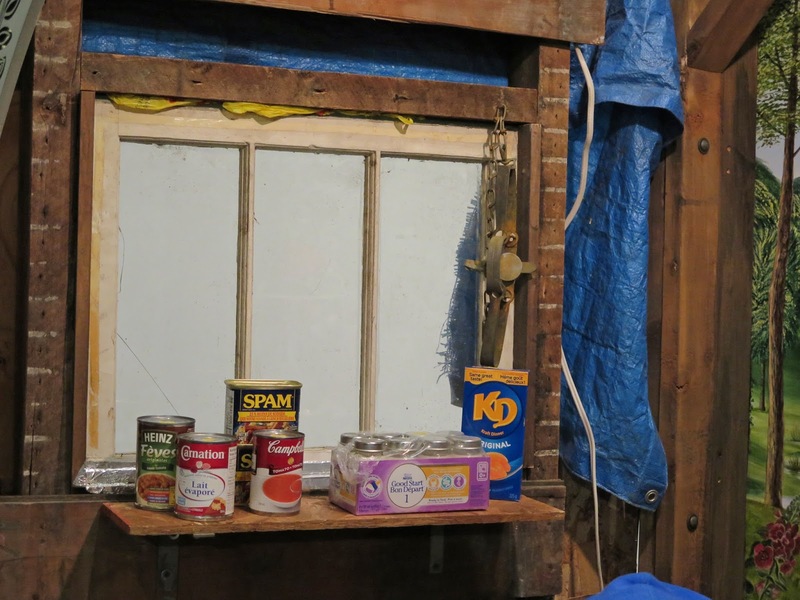 Instead of a manger, the scene is set in a Res House, where the squalid living conditions include unsafe drinking water, and over-priced, unhealthy foods. The beaver is an important and frequent symbol in Monkman's work, representing the fur trade, and often acting as stand-ins for indigenous people in his paintings. 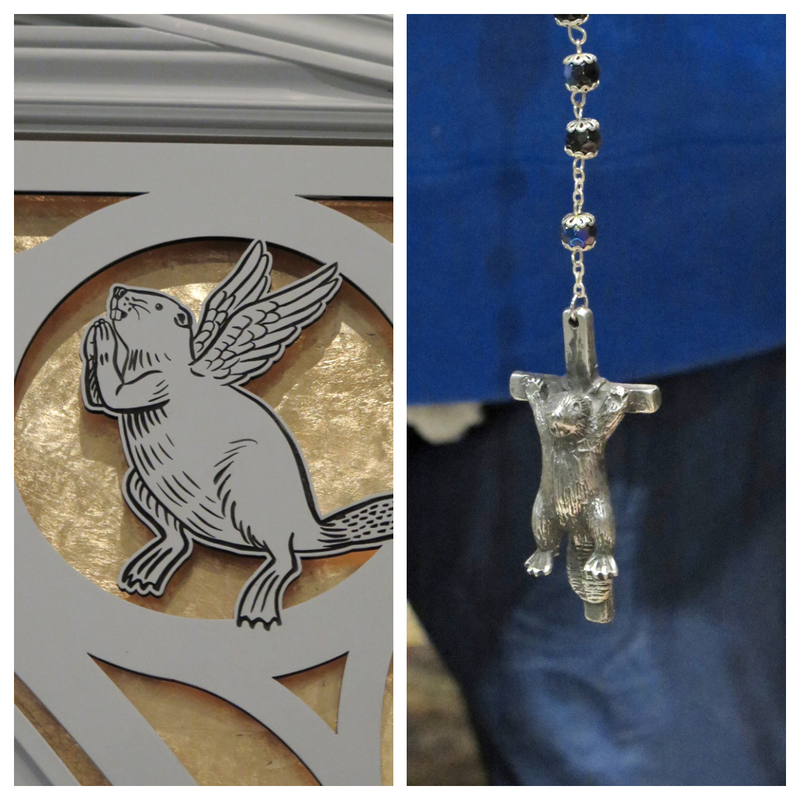 In the Nativity piece, beavers appear as angels, heralding Miss Chief's birth, and on a crucifix, worn by the male figure. 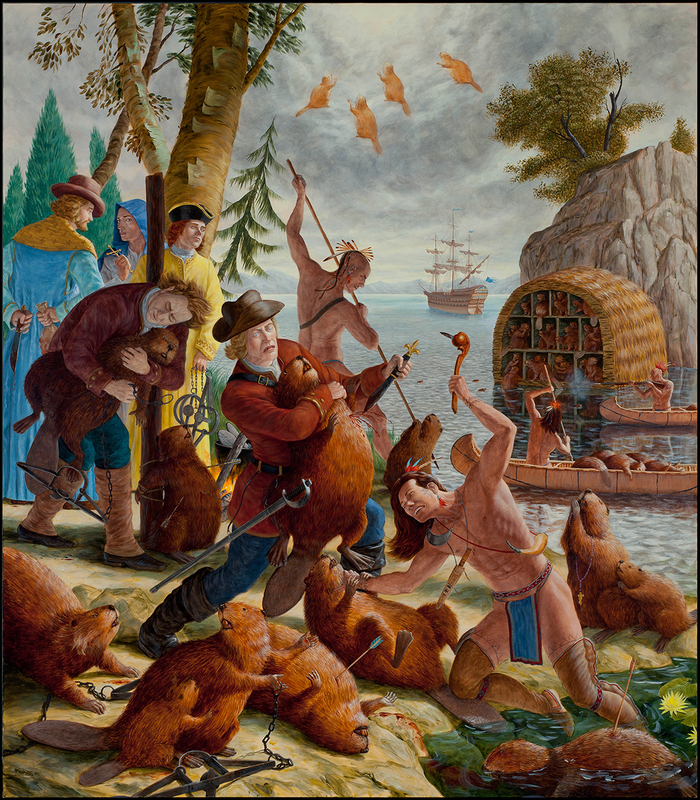 Monkman's painting Les Castors de Roi (The King's Beavers) is an example of beavers used as symbols, representing the slaughter of indigenous people. I have known the woman on the left for many years, and she is a devoted fan of Monkman's work. She was moved to tears by the opportunity to meet him. Nativity Scene will be on tour after this weekend, but will return to Museum London in March, 2018 to be part of their permanent collection. I think that you described it perfectly, the campy sarcastic humour, the disturbing narratives. Amazing! Very powerful. Reminds me a little bit of a Crow artist in Montana named Wendy Red Star, also a multimedia artist. What good fortune to see this installation in person! Wow, I'm glad you were able to attend this event. Monkman's work is very powerful. There is so much to say about the work and the city's decision. What a wonderful legacy for volunteer Ms. Martin-McLaren as well. Thank you for introducing me to this amazing Canadian artist. This was very i structuve and entertaining. I am going to send you a DM with a question.